Situated in the northern suburb of Zhaoqing. Guangdong Province, the Star Lake is a famed scenic resort consisting of the well-known Seven Star Rocks and the lakes around them. Seven monoliths with steep surfaces stand by the lake like the Big Dipper, and are scooped into a series of limestone caves. A network of dykes divides the lake into five parts, and more than forty pavilions, terraces, kiosks and storied chambers stand by the lake and on the dykes, and the rocks with their lush vegetation covers set off the silver liquid of the lake in a most picturesque way. 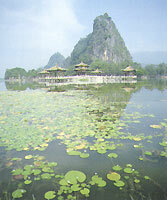 The Star Lake is a paragon of the Chinese garden culture.